Mesenchymal Stem Cells: What are they? Mesenchymal Stem Cells: How do they work? 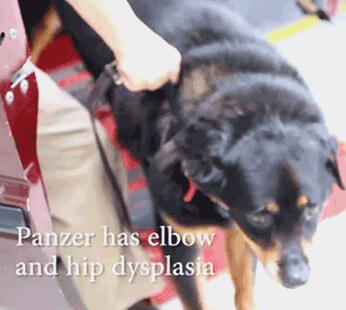 Panzer is a 13-year-old Rottweiler with painful elbow and hip dysplasia (poor/abnormal development) and Fragmented Coronoid Processes (FCP). While rehabilitation and pain management helped him a great deal, it was evident he needed something more as his quality of life was beginning to fail. Stem cells was that something more for Panzer that literally saved his life because, otherwise, his parents were considering euthanasia. Panzer received Regenerative Stem Cell Therapy using only his own cells on May 7, 2015. Injections were placed directly into the affected joints, as well as an intravenous (IV) dose, which actually regenerated the cartilage in his hip joints, giving him the ability to walk again! In just two short months, Panzer went from needing assistance walking up and down steps, to full independence again and needing no help! Hip Dysplasia in dogs is a painful, chronic condition where the ball of the hip joint is malformed and does not fit properly together with the adjoining socket and, therefore, often warrants surgical correction. Normal wear and tear gradually scrape away the cartilage inside the socket and, as a result, causes arthritis. Although Hip Dysplasia normally begins between 4 to 8 months of age while the dog is still growing, it can also occur later in life as a result of osteoarthritis. The condition worsens for dogs who also suffer from obesity due to the added weight they are supporting. Symptoms of hip dysplasia mimic those of arthritis, such as a reluctance to get up or climb stairs, moving more slowly, intermittent or persistent lameness, and “bunny hopping”. Hip Dysplasia is painfully debilitating and obvious signs to look for include: disinterest in playing, moving more carefully and, possibly, you may even hear a grating sound when they move their hips. A common genetic disorder to specific larger breed dogs, including the German Shepherd, Great Dane, Labrador Retriever and Saint Bernard. Anti-inflammatory medications are usually prescribed for pain control, along with cold laser, heat, possibly acupuncture treatments and underwater treadmill sessions. Maintaining a healthy weight is also very important in managing your pet’s pain, as is with arthritis. Essential fatty acids (such as fish oil or flax seed oi) are used as a natural anti-inflammatory. Additional natural supplements being used today are glucosamine and chondroitin sulfate, and are believed to have health benefits as well. Note: It is important to mention that these common treatments may manage symptoms to some degree, but they do not correct structural damage to the pet’s joints. Various types of surgeries can be performed if the disease is caught before there is too much joint damage, otherwise a complete hip replacement is necessary. Panzer received Regenerative Stem Cell Therapy using only his own cells. Injections placed directly into the bad joints and/or administered intravenously can restore cartilage and function and, thereby, reduce their pain! Acupuncture and cold laser can help reduce your pet’s pain, and treatment protocols will be tailored to their specific needs. Anti-inflammatories can be prescribed for pain control; cost is dependent on the dog’s weight.